Compatible replacement set of wheels to get your Dyson DC01 vacuum on the move again, compatible wit..
Genuine Dyson replacement soleplate wheel kit for Dyson DC03, DC04, DC07, DC14 & DC33 vacuum ..
A genuine part, this Dyson wheel spigot is designed to fit with selected DC25 vacuum cleaner models .. This is a genuine Dyson replacement wheel for your vacuum cleaner. .. This is a genuine Dyson replacement wheel retaining kit for your vacuum cleaner.The kit .. This is a genuine Dyson replacement soleplate wheel for your vacuum cleaner. .. Stand Wheel Service Assy ..
Genuine Dyson replacement spare part. Rear wheel axle for DC04 / DC07 / DC14 / DC27 / DC33 v.. Replacement Dyson vacuum cleaner iron coloured rear wheel for Dyson DC14 and DC33 model vacuums. ..
Genuine Dyson vacuum cleaner replacement steel coloured rear wheel. 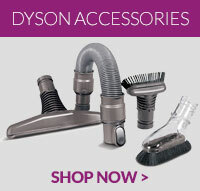 Suitable for Dyson DC07 and D..